swisslet: why'd you look so blue? why'd you look so blue? Until yesterday, I hadn't run a half marathon since 2012. For the most part, this was because I didn't think I'd be able to run more than six miles again because of injury and whatnot, but I'm happy to report that I was quite wrong about that. I don't know yet if I'll be able to run the full 26.2 miles of the London Marathon, but all my training so far is giving me confidence that this should be well within my grasp. 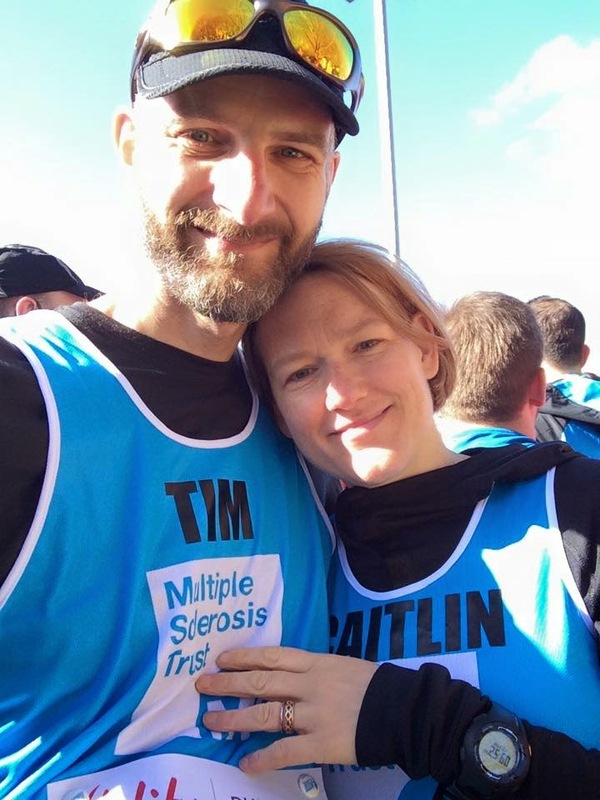 The training schedule said we should have been doing about eighteen miles, but it's also important to get race practice; to run with lots of other people; to road-test the kit you intend to wear on the big day... so we entered the Reading Half Marathon. We went round in an official time of 2 hours 6 minutes and 30 seconds, which isn't a PB for either of us, but is actually probably a bit faster than the pace we will want to run London. The course is supposed to be fast and flat, but this was actually the slowest half marathon I've ever run by about ten minutes. And you know what? It was also the most fun I've ever had in a race like this. The sun was shining and the good people of Reading were out in force, cheering us along for most of the route. I've long since known that it's essential to put your name onto your shirt to give people something to shout, but it turns out that being six foot five inches tall and wearing a blue tutu is quite a good way to get the crowd to engage with you along the way. Only one pre-teen urchin called me a "homo", and everyone else was very encouraging. I was a particular hit with little girls and with cheerleaders. Judging by her game face, I think it's fair to say that C. enjoyed herself too. We ran at a very steady pace, at least according to the official splits. Normally, when I run something like this, I'm so flat out trying to achieve a particular time, that I don't have much time to look around me. This time, because I was running at comfortable pace and because I'm now regularly running further than 13 miles, I was able to enjoy the sights and sounds of the day and to enjoy sharing the experience with my wife. I saw a red kite swooping low over the race! Running through reading town centre at around the six or seven mile mark was fantastic because there were loads of people out cheering us on. For the first time since we started training, I started getting really excited about the experience of running London next month. Yes, I'll be running twice as far, but there will also be hundreds of thousands of people lining the route, and that's a really thrilling thought. There's still some hard work to be done in training yet. This week is the peak in terms of miles, and next week sees the longest single run (20-22 miles), but after that we're on the taper down for the big day. This has taken up hours and hours of my life and it isn't done yet. I've poured a lot of blood, sweat and tears into this and it's increasingly dominating my life. You know what? I'm really looking forward to this. I'm very much looking forward to getting it done and being able to do simple things like have a lie-in on a Sunday morning without needing to do an enormous run, but it's really going to be worth it. And once we're done.... I want to run a sub-22 minute parkrun and a sub 1:45 half marathon. Maybe starting once I've had a day or two off, eh?